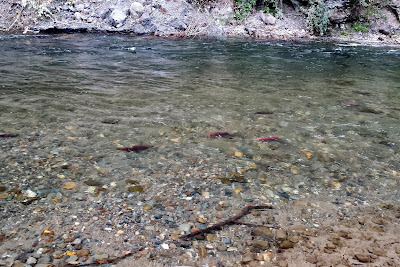 I was recently lucky enough to chaperone my fourth grader's field trip to the Cedar River to watch sockeye salmon spawn. It kind of blows my mind that I have lived in Seattle for more than a decade and have never once witnessed this with my own eyes. All those oblong reddish things are the salmon. In short: it was very, very cool. The first thing we saw before even getting to see salmon was a pair of bald eagles hanging out in trees right near us. I don't think I had ever been so close to an eagle in the wild before. 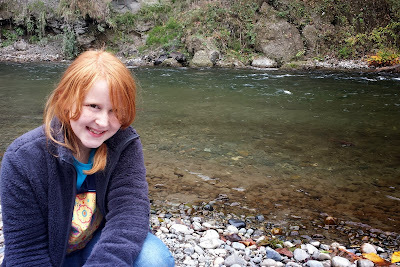 The kids in the class knew more about salmon than I do (which isn't hard, I basically know nothing about salmon) so I spent the day absolutely soaking in the information shared by not only the teacher, but by my daughter and her classmates and the other chaperones on the trip. Iris hanging out by the river. We learned about the path the salmon take to get to this river, which is not an easy feat, coming in off the Puget Sound, then going through a set of locks, down the ship canal that puts the salmon through two lakes (Lake Union and Lake Washington) then they swim south to the bottom end of Lake Washington before they start heading up the Cedar River. 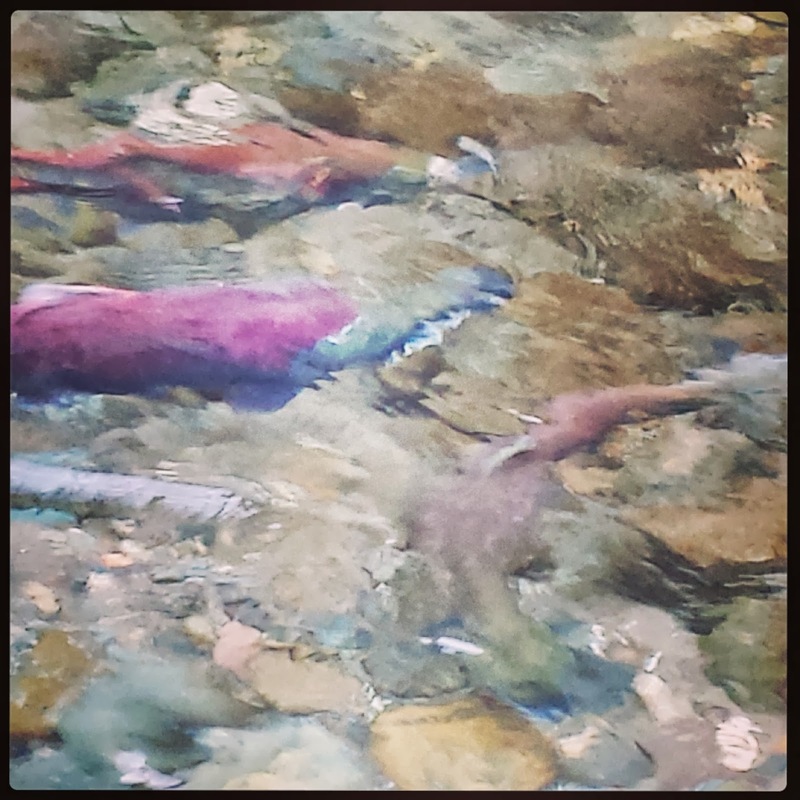 I never, ever knew so many salmon made their way through Seattle's waters. I have no idea why I didn't know this, because I have visited the salmon ladder at the Ballard Locks before, I guess it just never occurred to me where they ended up after that! (p.s. that is my new favorite scarf. We learned about what makes an environment good for salmon (like lots of small rocks on the river bed and a windy ((as in, it winds back and forth)) river so there are spaces for salmon to rest). We also learned what doesn't make an environment good, like all sorts of pollution, and invasive species choking out trees along rivers that are necessary for shade. This was my favorite picture of the day, which is how it look after I "instagrammed" it. It looks like a painting, doesn't it? I wish I had a watercolor of this. We learned quite a bit about the ways that humans have totally wrecked the natural flow of a salmon's life and their ability to spawn, which shouldn't have been as big of a surprise to me as it was. 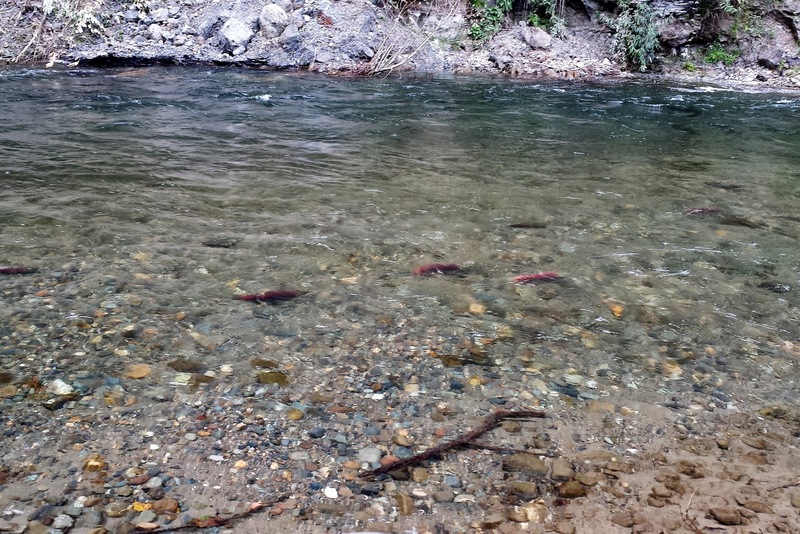 It turns out that basically all of the salmon we saw were a result of local hatcheries. It was uplifting to know that humans are trying to do some good, too. After messing everything up first. After we finished at the first part of the Cedar River we loaded back on to the bus (oh, I don't miss those stupid yellow busses!) and went to check out a weir. The picture above is overlooking a weir. This weir is at the mouth of the Cedar River and it is designed to trap sockeye salmon in a pen. 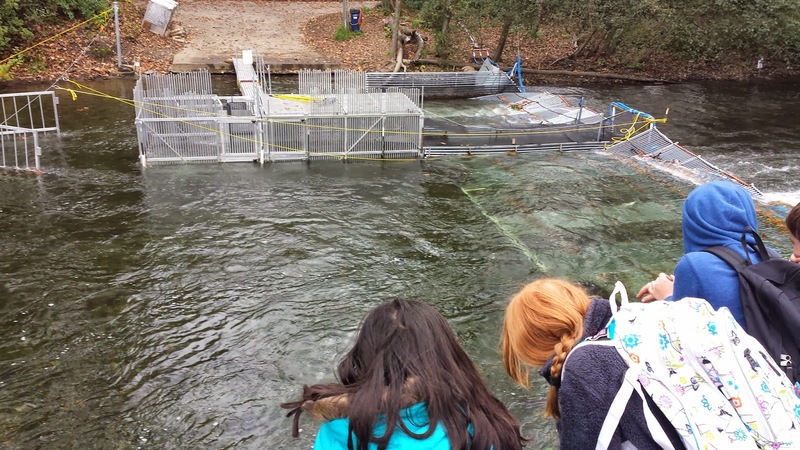 the pen is in the middle, and there are "gates" on the left and right of it, preventing salmon from getting through, so they end up swimming in to the pen. 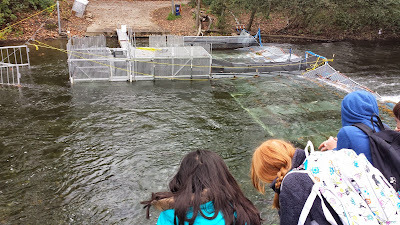 The weir is designed to only trap sockeye salmon, and they are collected from the pens (if anything other than a sockeye is trapped it is released) and then trucked to a facility that harvests the eggs and sperm and makes new little sockeye salmon and puts them back in to the river. I didn't exactly understand every detail of why this was necessary, other than, if this didn't exist, the sockeye wouldn't really be able to reproduce in the numbers they are now. You know, because humans wrecked everything. These kinds of field trips are my very favorite. 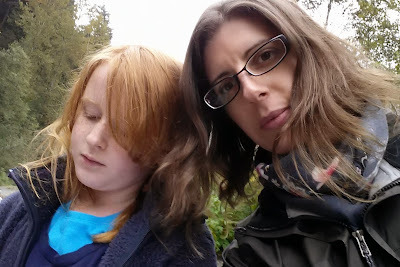 I have been to the zoo three times as a chaperone (three times too many, if you ask me) and I find those trips just horrible and exhausting and, honestly, not that educational. Everything about the salmon field trip was not only educational, but a lot of fun. I personally feel like connecting kids to animals and the environment in this way will do a lot more for solidifying a love for protecting the environment than checking out exotic animals in pens.